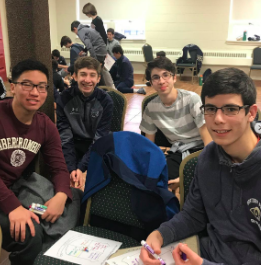 This past Wednesday, Oratory’s entire sophomore class traveled to the Archdiocese center in Kearny. The students were joined by the Campus Ministry Team and numerous staff members. The focus of the day was about growing spiritually and discovering yourself. The sophomores split up into several groups consisting of around 10 kids, and discussion was led by either upperclassmen or teachers. Everyone was given a couple worksheets and expressed themselves with words and drawings. First, the students talked about their strengths, weaknesses, and favorite hobbies and subjects. Next, they conversed about heroes and people who are considered heroes to them. A speech from senior Pat Jackson was given, and traits were brought up regarding what it takes to be called a hero. Showing selflessness was stressed and the sophomores learned to appreciate what was around them. At noon, lunch was provided for each student and most would say the food was pretty good. After the break, another senior, Nick Mascolo, talked to the sophomores concerning his involvements in various communities. He spoke about being apart of the tight-knit Cross Country team here at OP and also mentioned the time he dedicates to his Church. Finally, later in the day, each student wrote a letter to their future selves, which they will all receive during their Senior Retreat. Students could write whatever they wanted, as no one but themselves would read the letter. The Sophomore Retreat turned out to be a great learning experience for everyone involved. A big thank you goes out to Mrs. Otterbein, Mrs. Michalski, Mrs. Gribbin, Mr, Kearns, and Mr. Gordon for organizing the event.